South-west of the town is a little known site that in the late 50’s was part of the UK ’s defence system against Soviet nuclear bombers. The site is just north of Tye Common Road at Elmshaws Farm. The site was constructed sometime between May 1952 and February 1955 and consists of four gun emplacements placed in a semi-circle. Each gun emplacement had an ammunition recess and an integral shelter. About 100 yards towards the road lies a larger building which may have provided an Operations Centre. It is likely that the guns at the site would have been 3.7 inch anti-aircraft guns. 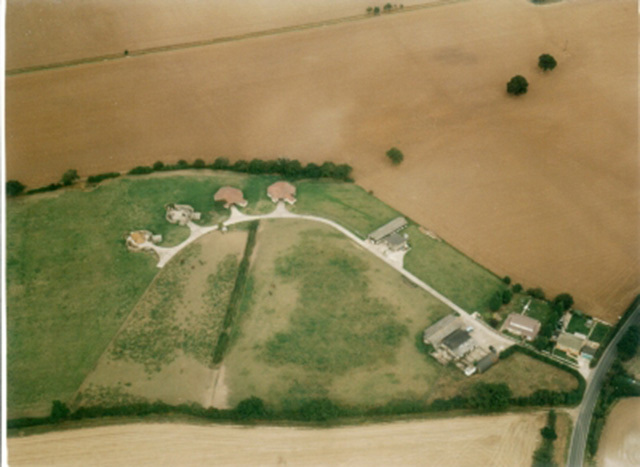 The top photograph shows the site as it is today in industrial use note the layout of the original gun emplacements together with the walls surrounding them. One of the emplacements has been roofed over. The next photograph shows the site in 1960 probably after decommissioning. Finally the map at the bottom shows the exact position of the site. This site was on my cousin’s farm. It was one a chain of sites used for maritime navigation in the Thames estuary. The company who produced the equipment was Decca. These systems were eventually phased out by the late seventies. I have no report of an aerial array in the area, but the guns would have need some direction. This could have been a local radar system or a more distant system. Does anyone else remember aerials just off Tye Common Road.